Allen, Texas - The ECHL Kelly Cup Champion Allen Americans announced today that the club has signed defensemen Trevor Ludwig and Garrett Clarke to contracts for the 2015-2016 season. Trevor has been here for all three Allen titles, while Clarke was a part of 2013 & 2015 championship runs. Trevor Ludwig was born in Rhinelander, Wisconsin; however he has spent the majority of his life in Dallas/Fort Worth. He played his junior hockey with the former Texas Tornado of the North American Hockey League from 2002-2004. He was a 6th round draft pick of the Dallas Stars in the 2004 entry draft. He has 144 games at the American Hockey League level. "Trevor Ludwig is a steady stay home defenseman that moves the puck well," said Americans Head Coach and GM Steve Martinson. "With Garrett Clarke we get a physical player who has the potential for a breakout offensive season." Garrett Clarke is back for his third season with the Allen Americans. He returned to Allen last year, after spending the 2013-2014 season with the, now dark, Arizona Sundogs. Clarke had one of his best seasons as a pro in 2014-2015 with 13 points in 57 games, while racking up 205 penalty minutes. 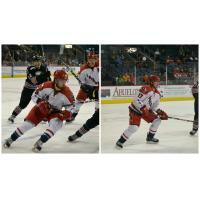 Clarke has been a versatile player in Steve Martinson's lineup, playing both up front and on defense. The native of Windsor, Nova Scotia, will turn 24 this November.